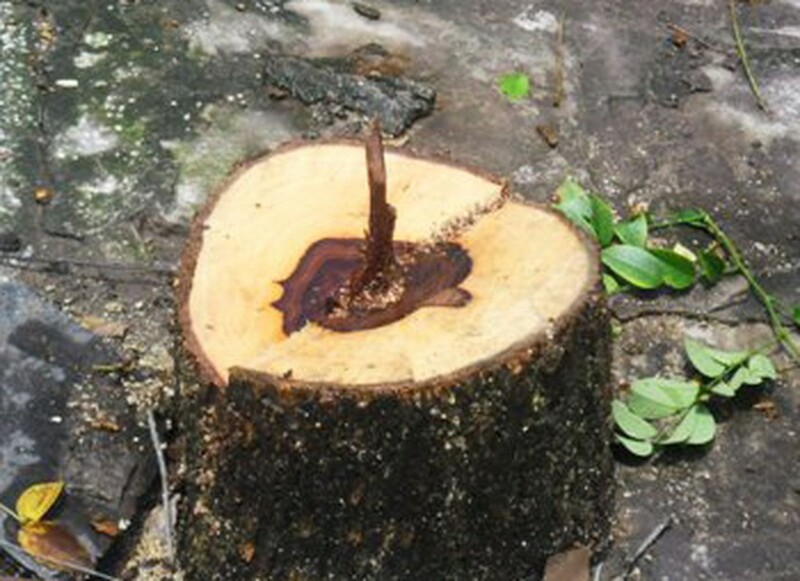 According to a Saigon Giai Phong source, a group of 13 lumberjacks from Phuc Trach Commune in Bo Trach District in the north central province of Quang Binh have chopped down a sua tree in Hung Vuon forest in Phong Nha-Ke Bang National Park. The sua tree was chopped down a week ago in Hung Vuon forest, which is near Hung Tri forest where three ancient sua trees had been chopped down in April last year. The group of 13 lumberjacks cut down the sua tree--said to have a diameter of 30cm and worth VND3 billion (US$144,000), and sawed it at site in the forest. Luu Minh Thanh, director of Phong Nha-Ke Bang National Park, said that he did not know about such an incident and has tasked some of his staff to determine if a sua tree has indeed been chopped down. However, so far this has not been determined. The People’s Committee in Phuc Trach Commune said that they heard about the case but have yet to verify the facts. Sua is a rare and valuable wood species with scientific name ‘Dalbergia tonkinensis prain’.